THE STORY OF LOUIS PASTEUR—“Yes, again! Again and again! 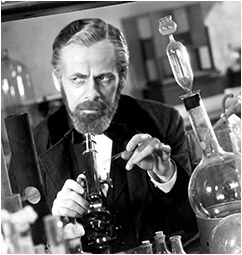 Remember our aim: find the microbe, kill the microbe.” Venerated biopic that began a successful cycle of similar pix featuring star Paul Muni, maybe the 1930s most highly regarded actor. It’s a long haul since 1936, and time has taken its toll on his rep (he’s not all that charismatic), as well as the movie’s, but film buffs should still be impressed by his portrayal, especially in comparison to the styles of other stars from the period. As for the rest of the production, it’s standard shallow gloss, with lots of high-minded speeches, punctuated by irate outbursts from the pompous and skeptical. 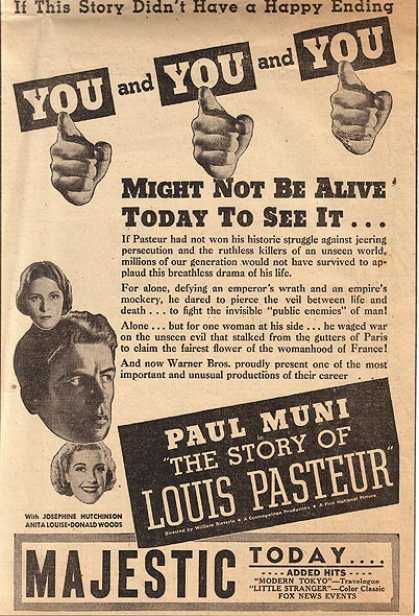 Admiration is garnered, though, by managing to make the discovery of cures for anthrax and rabies fairly interesting to watch for 85 minutes. Directed by William Dieterle, it won Muni the Oscar for Best Actor, as well as copping the prizes for Screenplay and Story. It was nominated for Best Picture. Co-stars are Josephine Hutchinson, Anita Louise, Donald Woods, Fritz Leiber, Akim Tamiroff and Porter Hall.